This oval end table is lovely accent piece for your home. Provide style to your space with the table top and two open shelves of the narrow table and the beauty of its ash veneers in a dark woodtone finish. The Sebring Oval End Table by Progressive Furniture at AHFA in the area. Product availability may vary. Contact us for the most current availability on this product. Case Detail Casters on Cocktail Tables. 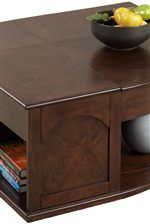 The contemporary Sebring occasional table collection offers sophisticated style to your home's living area. The transitional design balances a casual contemporary appeal with lots of useful functionality with casters on the cocktail tables and open shelves on each piece for storage and display options. The medium ash finish highlights the beauty of the wood veneers. The Sebring collection is a great option if you are looking for Contemporary furniture in the area. Browse other items in the Sebring collection from AHFA in the area.